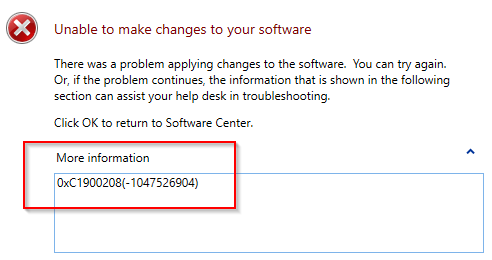 When deploying Windows 10 1709 Feature Update using SCCM, you may encounter errors when running the installation in Software Center. 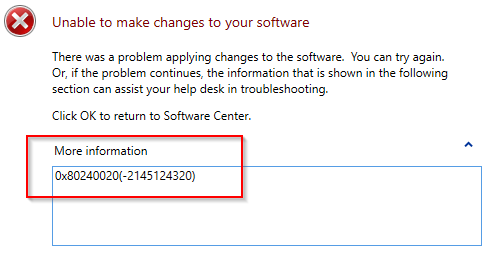 These errors are sent by the Windows setup itself, they are not related to SCCM. In this post, we’ll show you how to troubleshoot these error and how to resolve the error 0xC1900208 – 1047526904. This post assumes that you’ve done the preparation steps to deploy features upgrades with SCCM. Here are some basic troubleshooting tips that you need to understand before proceeding. This blog post is not about troubleshooting any errors, we’ll focus on the frequent 0xC1900208 error but we think that you need basic understanding before proceeding. If you’re already familiar with this process, skip to the next section. So let’s get back to our main topic which is resolving Error 0xC1900208 – 1047526904. This post has been made on Windows 10 computers using build 1607 and 1703. When retrying a second time the error 0x80240020 is returned. Don’t use this error for troubleshooting, use the first one. 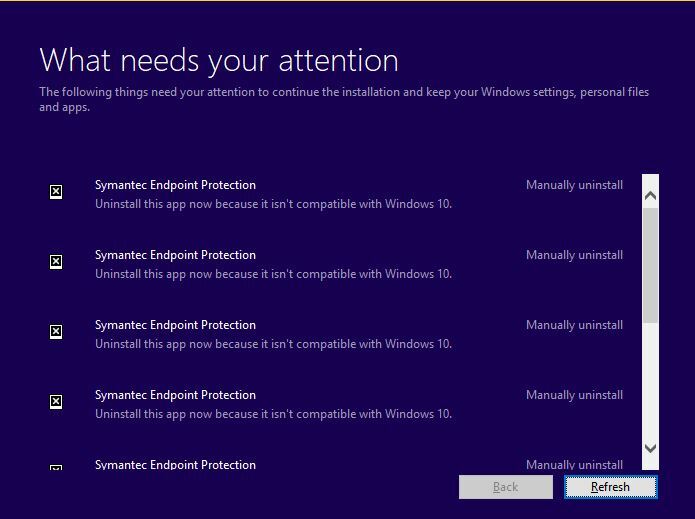 Following Microsoft documentation our error is due to : This could indicate that an incompatible app installed on your PC is blocking the upgrade process from completing. Check to make sure that any incompatible apps are uninstalled and then try upgrading again. 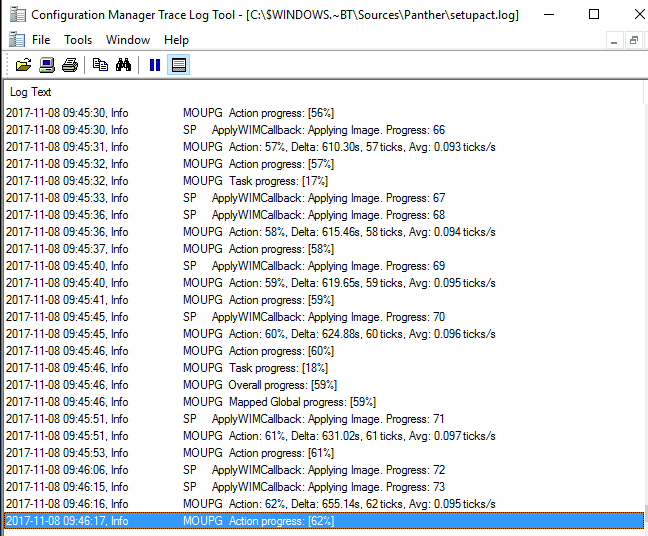 The first easy troubleshooting step you can do at this point is to launch setup.exe from the C:\$WINDOWS.~BT directory. After going through the first screens, the setup will warn you about those incompatible apps. Here are 2 examples we encountered. Once uninstalled, a couple of steps must be performed to restart the upgrade process. If you simply hit Retry in Software Center, it won’t work. You’ve now mastered the 0xC1900208 error and can continue your Windows 1709 migration ! in my case upgrade is working fine but in sccm report, it is showing as Failed to install update(s). Which log I need to check. Firstly, Id like to say thank you for writing up this great documentation. I believe this is my issue for sure. So I followed the steps and it seems that after I deleted the CCM Cache, the C:\$WINDOWS.~BT folder, and the SoftwareDistribution\Download folder I ran the actions in Configuration Manager and now I cannot get the update to show back up in Software center. Any Ideas on what could cause this or what is preventing it from coming back? Im running 1607 trying to feature update to 1709. I am having the exact same issue. I cannot get the update TS to show up in the Software Center again. Have you found the fix? Great info, not even Microsft knows this. I had spend hrs with them and they were not able to read their own logs. you send me in the right direction and saved me hours of work. Just a snip of what you can do to deal with these compatibility error messages. 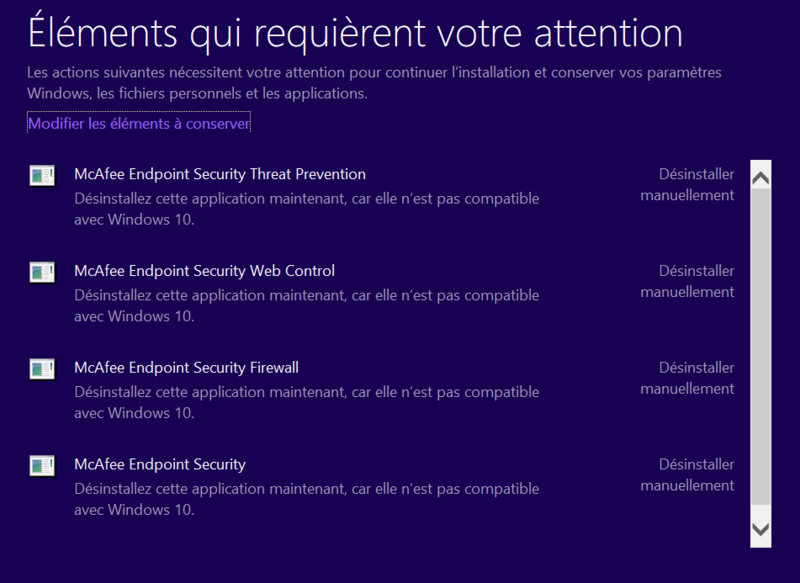 I have similar error for Microsoft End Point Protection as incompatible app for Windows 10 in place upgrade. Had to uninstall Microsoft End Point Protection from Control Panel and then retried in place upgrade from Windows 7 Entp and Windows 8 Entp to v1709 Windows 10 Entp. The process went without any issue and in place upgrade was successful. All apps worked and the user data was intact. So, If anybody is trying for in place upgrade from Windows 7 or Windows 8 to v1709 Windows 10 Entp check for incompatible apps.